HOW THOSE GREAT B&W PRINTS WERE MADE...a peek into some nearly-forgotten photographic techniques. The noted photographer Richard Avedon was famous for many things, not the least of which was the fantastic technical quality of his black-and-white prints. During my first years as one of his assistants I learned how this was achieved, and later as his studio manager was able to expand on the techniques. They were quite unusual, and very contrarian to the official methods promoted by the likes of photo schools and even Kodak itself. Today, of course, only a handful of enthusiasts still practice traditional chemical-based darkroom work, but for them, for anyone curious about this part of photography's past, and for the historical record, I will tell all I know. Right here. Bear with me, this gets a bit technical. In the earlier days, pre-1962 and before electronic flash had been fully adopted, many of his most luscious pictures were taken by hot incandescent lights, in particular by a 1,500-watt lamp in a reflector about 18" in diameter with a thick fiberglass diffuser. This was placed very close to the subject, just outside of camera range, on a stand that could easily be moved as the subject moved. Often it was only a foot or so from their face. The film being used in the 120 Rolleiflex TLR camera was Plus-X, and the exposure set at 1/60 second at f/8. This resulted in deliberate overexposure, the first in several unorthodox steps. Around 1962 we began using a BALCAR 1200 studio strobe with an umbrella reflector, at its full output of 1,200 joules. Again, this was placed as close as possible to the subject, just out of camera range. Because of the huge light output of the strobe we switched to Panatomic-X film, with an ASA index of 25, and stopped down to f/16. This still resulted in considerable overexposure, as before. Built-in flashes on typical amateur cameras, by the way, probably output no more than 20 joules. The reason for being so close is simple: the ratio of light reflectance from the subject is in direct proportion to proximity. If a light source is more than a few feet away, the same amount of light falls on every part of the subject that is not in shadow, resulting in a flat light. If it is close, different parts of the face or body receive differing amounts of light, resulting in a "rounder" or more dimensional appearance. Not only was the film overexposed, it was also overdeveloped. We used a long-forgotten developer that was popular in the 1930s when 35mm cameras were coming into use and when film was much granier than it became by the 1950s. Formulated to reduce grain by smoothing the edges of the individual silver halide clusters, Panthermic 777 was a godsend to early adopters of 35mm. By the mid-50s, as films improved, it had fallen from favor, and had to be specially ordered as a liquid in glass one-gallon jugs. We liked it because, when used for extended developing times, it produced dense negatives with remarkably smooth tonal transitions. After numbering, the negatives were contact-printed. Nothing fancy here; all photographers did the same thing. When a series of selections were made from the contacts, "rough prints" were made in either the 8" x 10" or 11" x 14" format. From these a final image choice was made. Now the fun begins. From the 1940s until about 1960, "finish" prints were made on DuPont Defender graded papers, developed in Dektol. In the early 60s, after DuPont stopped making papers, a miracle arrived from Germany. Agfa Brovira paper was so far superior to any other B&W photo printing paper that there was no comparison. The reason was simple: the good folks at Leverkusen were willing to spend money and use an extraordinary amount of silver in the emulsion, resulting in much richer blacks and shinier whites. Our finish-print darkroom was equipped with three enlargers, two wall-mounted Omega D2s (above, left, with our assistant Jan Forstrom in 1965) with extended tracks, and a monster Saltzman 8 x 10 (photo, right) that was a good 14' high, used a mercury-vapor lamp, and had remote controls. Most of the work was done on the Omegas, using interchangeable cold-light, condenser, or pin-point lamp heads, and Nikkor lenses. Finish prints were usually made in the 16" x 20" format. Close at hand were a variety of dodging and burning-in tools, although I preferred to just use my hands to control the exposure on various parts of the picture. This skill can only be gained by experience. This may seem a contradiction, but lighting in a darkroom is important. You have to be able to see what you're doing. Ordinary "safelights" are really not up to the task; if they're dim enough to allow you to see the projected image during exposure, they're not bright enough to carefully watch it develop and know when to stop development. Fortunately, B&W photo papers have no sensitivity at all to a quite narrow slice of the visible spectrum — the very wavelength emitted by sodium-vapor lights. So we used a Duplex safelight (photo, right) hanging from the ceiling and equipped with a chain that operated a trap door. During exposure, the doors were partially closed to block most of the light; a yank of the chain flooded the room with bright but perfectly safe light during development. The exposed paper was developed in a large tray of Dektol, surely the most popular developer at that time. But we "enhanced" it by adding additional hydroquinone, one of its key ingredients, to achieve even blacker blacks. We also had a small cup of hot concentrated hydroquinone at hand, with cotton balls and Q-tips to speed development of certain portions of the picture. Sometimes, after the print was in the fixer stage, we decided that the little highlights needed a little boost. So we washed it off and gave it a quick bath in a weak solution of potassium ferricyanide (dangerous stuff — always use rubber gloves! ), then back in the fixer and wash. Finally, after washing in a Pako rotary-drum washer, the prints were soaked in a gylcerine solution prior to drying. This kept the emulsion pliable and prevented curling. Now for the real secret — no expense was spared! Most prints were made at least ten times over until the "perfect" one emerged. Sometimes more than twenty times. I have at times spent an entire day on just one print. This is expensive, both in materials and in labor. The Agfa paper was not cheap, and had to be ordered in large quantities from Germany as their American distributors did not keep enough of the various sizes and contrast grades on hand. Sadly, it is no longer made, but other worthy papers continue to be available. The art of Black-and-White printing is now being kept alive by a new generation of dedicated craftspersons. I salute them. FILM PHOTOGRAPHERS REJOICE! Panthermic 777 developer and a lot of other old stuff is still available. CLICK HERE. 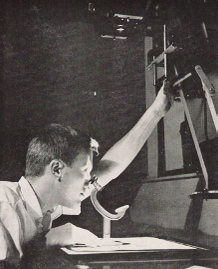 That's me in one of the darkrooms in 1965, as reported in Photographic Methods for Industry. I used to write for them. CLICK HERE for a look at modern commercial darkrooms in London, with some fabulous enlargers! I enjoyed so much reading your essay on the Avedon years. As one who counts Avedon as his favorite photographer, I found it especially inspiring. I have sold nearly all my digital equipment, and now primarily use a Hasselblad to make darkroom enlargements. The explanation of the process was excellent. And you are right, of course...making images the old fashioned way, as it were, requires immeasurably more skill. Was the Panthermic 777 always in liquid form, or did you mix it from scratch? If so, do you have the formula? Thanks for the comment. The Panthermic 777 that we used always came premixed in glass 1-gallon jugs. Some people made their own, but I understand that it was difficult to mix. I don't know the formula, but it should not be hard to find via a google search. Thank you, thank you!! It was a pleasure to read about your experience and Richard's methods in the darkroom. I'm currently a student in Santa Fe, NM, working on my thesis, much in the style of Avedon (one of my favorite photographers). I mix my own developers, and I can't believe I didn't think about keeping a hot cup of HQ! Brilliant. Do you have a formula for the glycerin solution you mentioned?? I'm am printing large and paper curl is a constant battle. Off to the darkroom to try some new things!! Thanks for your comment. About the chemicals - they were all commercially prepared, pre-mixed in gallon jugs. The glycerin-based flattening solution that we used was, I believe, made by a firm called Heico. Kodak made a similar product. Both were concentrates, to be mixed with water. We kept a 16x20 tray filled with the working dilution next to the Pako rotary dryer. This had two notches into which fit a 20x24 sheet of plexiglass, leaning against the wall. Prints were always soaked for a while in the solution, then wiped down with a squeegee before being put on the dryer belt. The product was called something like "Photo Flat." It was important to not have the heat too high, and to not over-dry. The stuff had a pleasantly clean smell about it. I have no idea whether such a product is still made, and have no experience in mixing chemicals. To anyone interested, available for purchase is my late dad's PAKO ELECTROGLOSS DRYER, among other things. My late dad was A. L. Schmidt, Staff Photographer for Kalmbach Publishing Co from 1951-1993: Trains, Model Trains, Model Railroader magazines, etc. He was also a professional photographer who shot 100s of Milw (WI) couples' weddings in the 40s-50s-60s and also owned a Photography and Supplies store with my mom. Also have his H-F Print Washer, developing tanks, enlargers (Omega D2 and Federal 219, I believe). And you name it - SO MUCH OTHER vintage professional photography equipment. Much of the Graflex and other cameras have already been sold. But there's much left. These items were in his darkroom. I MUST SELL, as his house will be sold in Oct 2014. I don't have to heart to dismantle and discard these precious items. They will never be back in circulation. Now is the time, before it's too late.